For complete vacation or visitor information on the Outer Banks and the Dare County area (Duck, Southern Shores, Kitty Hawk, Kill Devil Hills, Nags Head, Roanoke Island, Hatteras Island, Dare Mainland), please use the following contact information. Or, feel free to stop by one of our four welcome centers and receive personal assistance. Our visitor specialists are there to serve you! 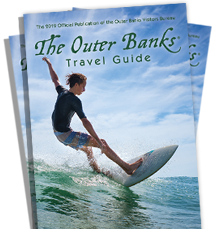 *The Outer Banks Visitors Bureau is not related to the Outer Banks Chamber of Commerce. The only locally owned and operated on-line newspaper serving both Hatteras and Ocracoke Islands.